A short two-day business trip or a planned staycation in the city, these hotels near the airport are good for both. Staying close to the airport doesn’t necessarily suggest a lame stay, especially if you hit up Swissotel for some Swiss pampering. Dip into their outdoor whirlpool or have a fun evening at the happening Maaya bar, or check into their Swiss spa for a good session of relaxation. Check here for more deets. Rajarahat’s Pride Plaza will let you indulge without costing a bomb. Spacious rooms, quick service, snazzy health club and two fine-dining restros — Pride Hotel is the middle class person’s affordable luxury stay. And if you’re looking for a banquet to host that family event then this hotel has several of them to offer for a good price. Check here for more details. Budget stays don’t always meet the value-for-money standards. If you’re looking for a place near the airport then Holiday Inn is your best bet. A rooftop pool, well-equipped fitness centre, two restros in house and a lounge bar, this one’s offering luxe comfortable stays under a healthy budget of INR 6K. Just 5 km away from the airport, you’ll watch more metal birds zip across the sky, than real ones! Go here to know more. 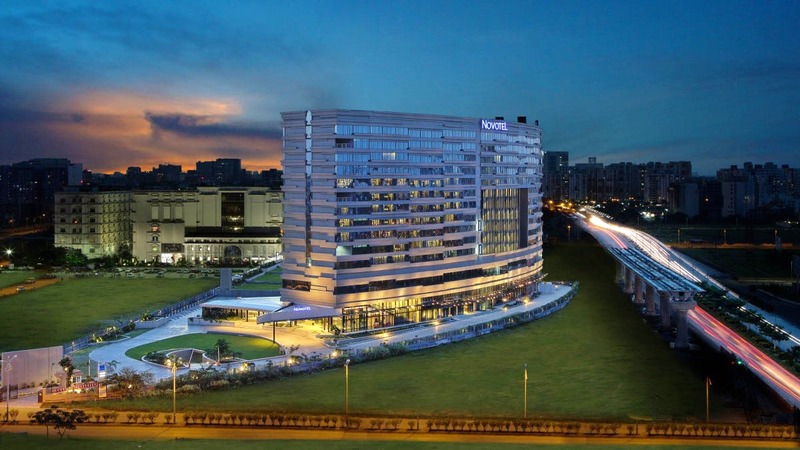 Not an offshoot of any chain hotels, O2 is a city brand which will take care of your comfort and your pennies. Expect no plush décor or high aesthetic indoors because budget is again the key word here. With forty-one rooms, a multicuisine restro and a mish-mash of a pub, this one will keep you comfortable till your flight out, all within a budget of INR 5K. See here for more info. This one is all plush and luxe and makes for an indulgent stay with a pool, spa, 340 luxurious rooms, three fine-dining restros and bars, and banquets to host your events. Holidays or staycations, this one is perfect for both because with all these pampering on offer who’d care to step outside this bubble? Check here for more deets. It’s in an alley behind a shopping centre and is no place to head to if luxury’s on your mind. When your flight’s late or in the wee hours of dawn, then putting up in a budget hotel with clean rooms (but no fancy amenities like spa or pool) is a logical decision. Howard Johnson’s is just ten minutes away from the airport and has a restaurant to keep you fed with wholesome food. Here’s your budget stay within INR 3K. Check here for more details.